Professional trainers and riders understand that the warm up routine they choose for each individual horse can be the deciding factor in whether they win or lose their class. Some novice riders, on the other hand, misunderstand the importance of this pre-competition step. They may not think about how they will ride their warm up until they put their foot in the stirrup. They may just wander around on a loose rein (which at least warms their horse's muscles) without checking to see if they have the horse's attention or can establish a connection with their aids. They may start drilling the horse on something he has not completely mastered in the hope he will perform the maneuver better that day. It is not uncommon to see a rider longing a nervous or high energy horse in order to tire him out. With a little planning, riders can avoid wasting this crucial prep time. Developing and planning a warm up routine appropriate for your particular horse starts at home. We discussed the variables to consider in your at-home training and planning to maximize the value of your show warm up in the Plan Your Warm Up Before Show Day article . Now it is show time. For a typical weekend show, you need to plan several different warm up routines. I show in dressage competitions so I will use them as an example, but the planning principles apply to any discipline. I like to arrive on the show grounds the day before my first classes. Arriving the day before gives both horse and rider time to settle in and get mentally prepared. Your horse may be stiff from the trailer ride. If it was a long haul, he will be tired, possibly a bit hungry and dehydrated. Get him settled in his stall and allow him to drink and eat while you set up the stabling area. When he has rested, it is time for his first warm up. You want to save your horse's energy for the competition tomorrow so, in general, you will just loosen the horse up by walking around the show grounds. Visit every arena, go by the flower boxes, the judge's stands, past trash barrels and anything unusual at the show grounds that the horse does not see at home. Remember that the horse sees things differently out of each eye. Pass everything in both directions so the horse will not be surprised when competition starts tomorrow. Your goal is a relaxed horse with a relaxed back, head lowered and neck lengthened while moving from your leg into a following hand. If you have an anxious or excitable horse who will only jig if you warm him up under saddle, plan to show him around from the ground. Know before you go which way is probably best for your horse. But whether you "heed" him in hand or ride him, keep your horse's attention on you and keep him on your aids. Relaxing the horse; warming, loosening and suppling his muscles. Refreshing the horse's response to the aids for movements he will do in the test. Finishing with a few final exercises that relax and supple the horse. If you know your horse and how long it takes him to move through these four phases, you can time your warm up so that you are finishing up just before your class is called. In Phase One, I use basic schooling movements: leg yielding, circles, serpentines, simple up and down transitions. I want the horse to relax his back, lengthen into my hand, and accept the aids without expending a lot of energy. On a geriatric horse, I might do this phase entirely at the walk with the aim of suppling his muscles and joints without stressing them before his class. On other horses, I will walk, trot, and canter according to the horse's energy drive and stiffness. In Phase Two, I ask the horse to move forward into my hand more while rounding his back and engaging the hind end. I use lateral work, shoulder-fore, smaller circles, and various transitions to collect and rebalance the horse as his needs that day may require. I do not school anything new with the horse. I am just refreshing the horse's muscle memory of the shape my aids are asking him to take with his body. In Phase Three, I want to check the horse's response to my aids for movements in our test. For example, on a horse preparing for a first level dressage test, I might check his canter departs, down transitions, and make sure he moves forward from my leg. On a horse starting third level tests, I might ask him to collect and extend, ask him for a few steps at half pass, and ask for a flying change. On a horse already doing grand prix tests, I might ask for a few strides of piaffe or passage and some tempi changes to check his response to my aids on that day. If a movement is new to you as the rider, you might want to check your coordination of the aids. This last minute check is just that--a check. This is not the time to school or drill or to ride the whole test. Save your horse's energy for the class ahead. You may do very little at all in Phase Three depending on your horse. If you are riding a schoolmaster, an older horse with physical issues, a lazy horse with low energy drive or a horse that just warms up better with collecting and extending exercises, you may not do any movements in the warm up. Phase Four is a quiet return to moving on the aids with rhythm and relaxation while we wait for the call to enter the ring. If I have done my warm up well, my horse will be on my aids, ready to transition right back into working mode, so we can make an energetic entrance that says, "Look at us, Judge!" In general, warm ups for subsequent classes take less time. If you are doing 2 or even 3 tests in a day, warms ups for later classes may be just enough to warm up muscles and get the horse on the aids. Altering your warm up to save the horse's energy is key to a winning strategy. Take weather and other stressors into consideration as you ride in additional classes. It may be 60 degrees for your morning class and 90 degrees by the time you show in the afternoon. Rain may have changed the footing, making things more difficult for the horses. Tired horses are more injury prone. By this time your horse should be well settled and need far less mental preparation than he needed the day you arrived. Previous warm ups and classes will have spent a good deal of his energy. This is definitely the day you do not want to lose your class by using up too much energy in the warm up ring. Evaluate the warm up plan you prepared before the show and make changes appropriate for your horse's needs before this final effort. Figuring out the best warm up plan for an individual horse is an art, not a science. Until you get to know a particular horse and discover what routines work best for him, you may blow a few tests. 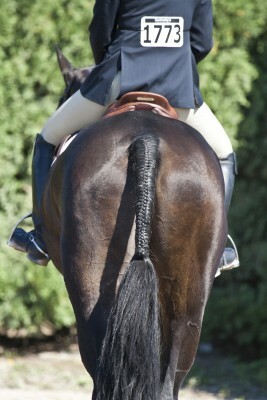 Chalk them up to experience until you understand your horse's best program. At the end of the day, remember that showing is about having fun with your horse! Your turn! Let us know your favorite show day warm up routine in the comments below.